Chivalry died a quiet death many years ago, but there was a time when it was all the rage. More than 800 years ago at tournaments in what is now northern France, brave knights would suit up in their helmets and hauberks, mount their warhorses and fight for fame and glory, occasionally getting gored or trampled in the process. As these events became more popular, the contestants developed a code of honor and loyalty that became known as chivalry. Perhaps the most talented and chivalrous of all the men who wielded their swords and shields, young William Marshal rode the fame he acquired at these tournaments to reach the pinnacle of gallantry and power. In this fast paced history – full of kings and queens, valor and treachery – noted medieval historian Thomas Asbridge tells the remarkable story of this man who rose from ordinary beginnings to become one of the most influential men in all of Europe, going down in history as The Greatest Knight. The second son of a minor nobleman, William Marshal was born around 1146. Having no inheritance to fall back on, he sought to make a name for himself by obtaining an education, learning essential aristocratic skills like hunting and fighting. Physically gifted and displaying a remarkable cool headedness in battle, he became famous throughout northern Europe and was knighted at the age of twenty. Not long after, he was appointed to protect King Henry II’s queen, Eleanor of Aquitaine, as she traveled within the vast Angevin Empire, which included present day England, much of Ireland and the western half of present day France. This experience served as the beginning of a lifetime devoted to the English throne, as William would go on to directly serve Henry II, his sons Henry the Young King, King Richard the Lionheart and King John, as well as John’s young son, King Henry III. Deeply involved in the political lives of each of these men, who were often at odds with one another, William was skilled and lucky enough to somehow survive the deceit, violence and incompetence of one of the most tumultuous periods of European history, finding a way to advance his noble cause against incredible odds. 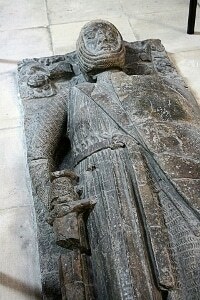 The funeral effigy above William Marshal’s tomb at Temple Church in London. 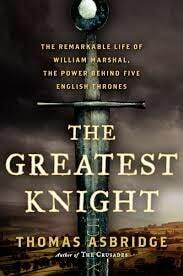 The entire remarkable story would probably still be unknown to this day if it wasn’t for a 13th century biography of William Marshal, the only known copy of which was found buried among numerous other ancient manuscripts in 1861 by a young French scholar. Asbridge bases most of his book on this Anglo-Norman epic poem, which is in turn based on the testimony of numerous eye-witnesses and members of Marshal’s inner circle. With an almost journalistic flair, Asbridge assembles a superbly readable story from this daunting source, but he never hesitates to question the unknown biographer’s motives and backs up the poem’s claims with outside information whenever possible. I’m not worth much when it comes to English history – too many King Henrys to keep track of – but despite my ignorance, I found Asbridge’s account thoroughly engaging and easy to follow. He writes to be understood; frequently referring back to previous events for those who may be struggling to keep up as the tale becomes complicated. The result is wonderfully told story about an amazing individual who played a key role in a number of profoundly important historical events. Spanning several decades that played a pivotal role in the birth of modern England, The Greatest Knight is a winning tale by a talented historian and storyteller that takes the reader back to an ancient time when chivalry reigned supreme. Highly recommended for all history enthusiasts.